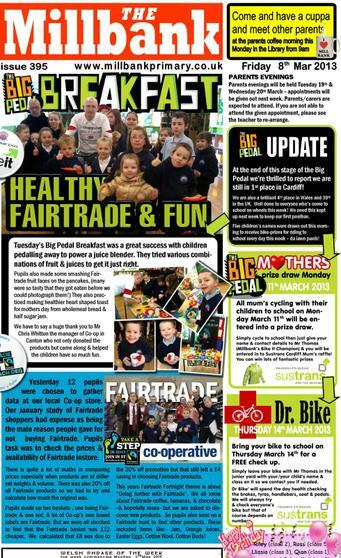 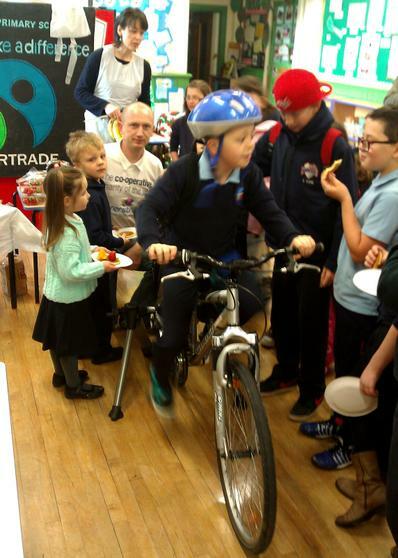 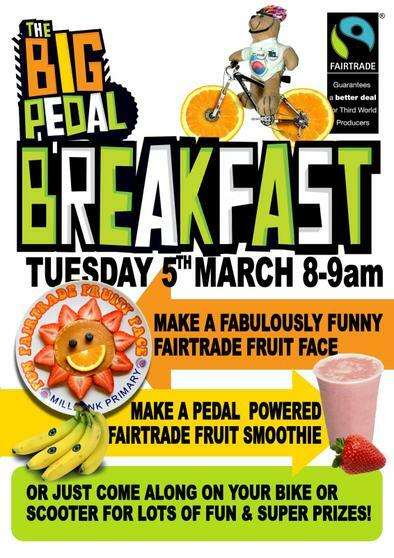 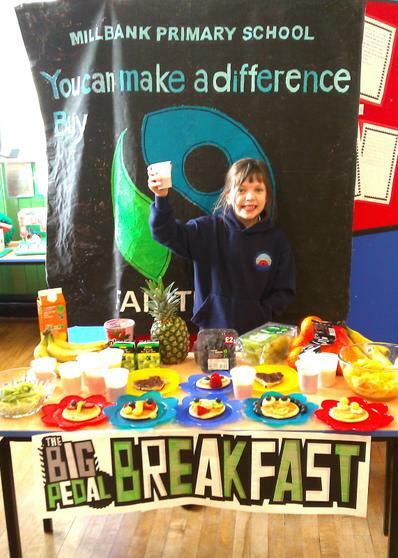 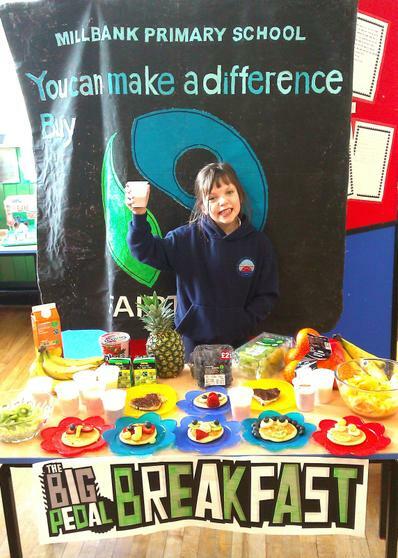 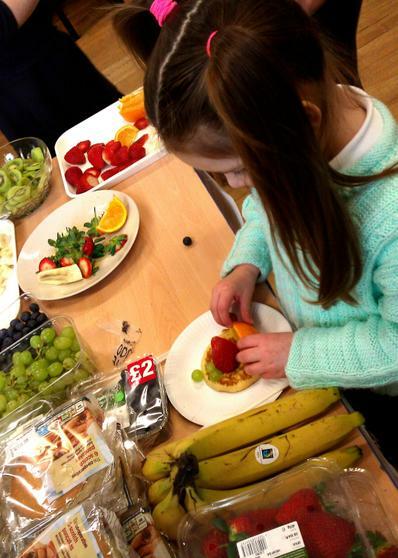 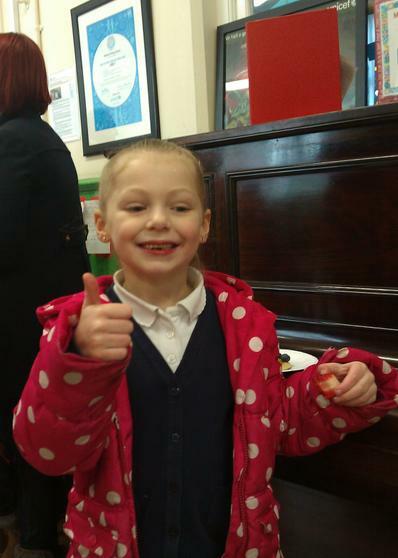 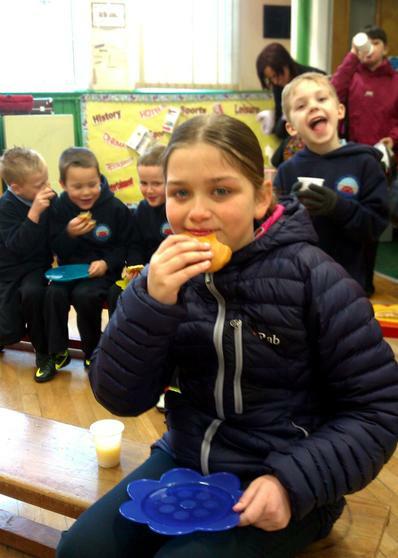 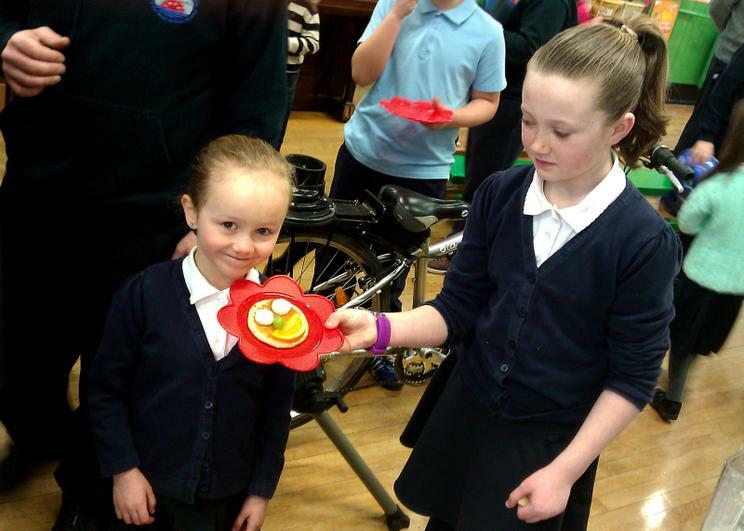 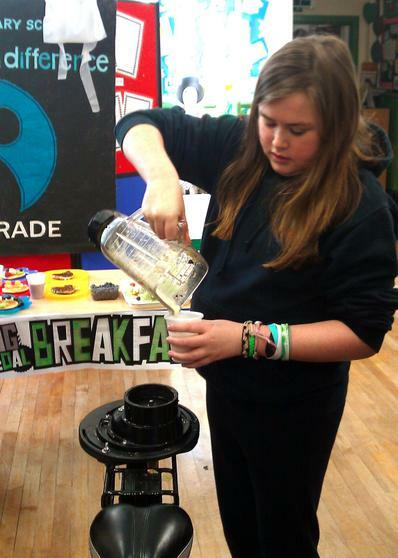 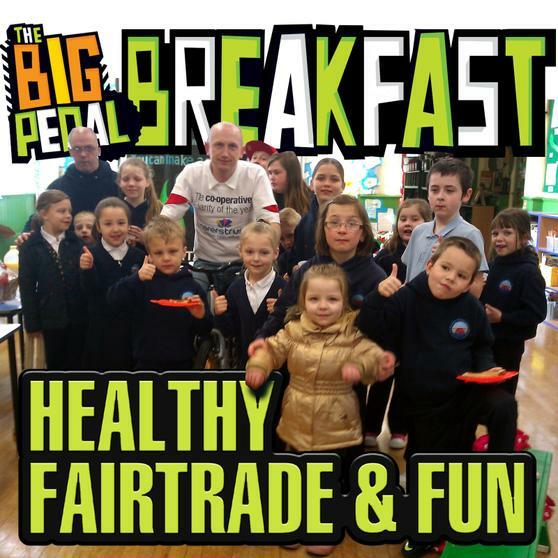 The Big Pedal is an important event at the school and overlaps with Fairtrade Fortnight so it seemed a good idea to combine the events & have a Healthy Fairtrade Breakfast. 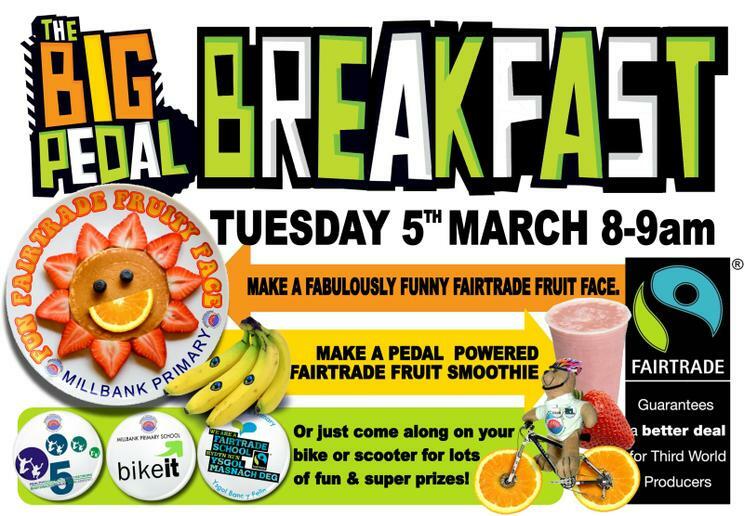 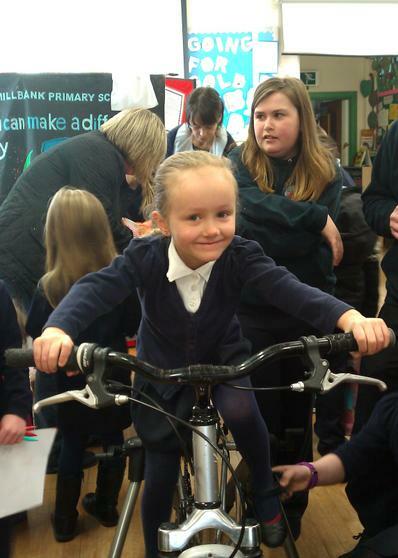 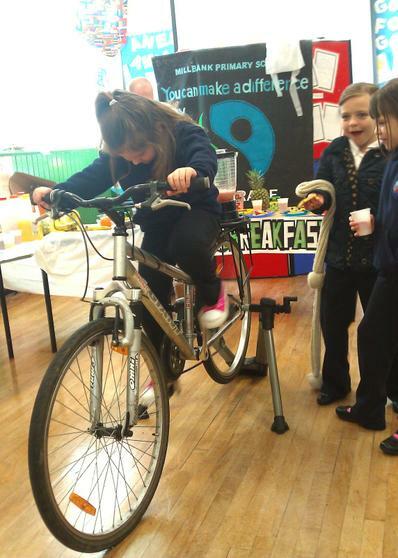 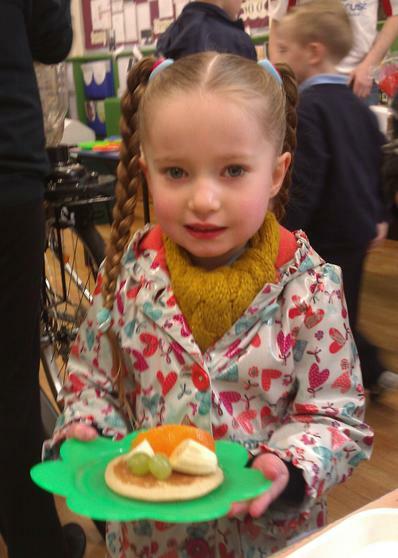 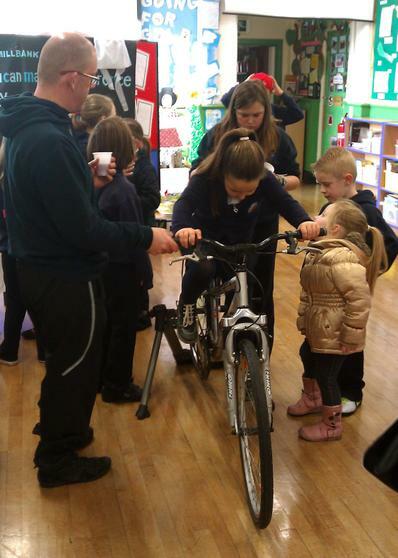 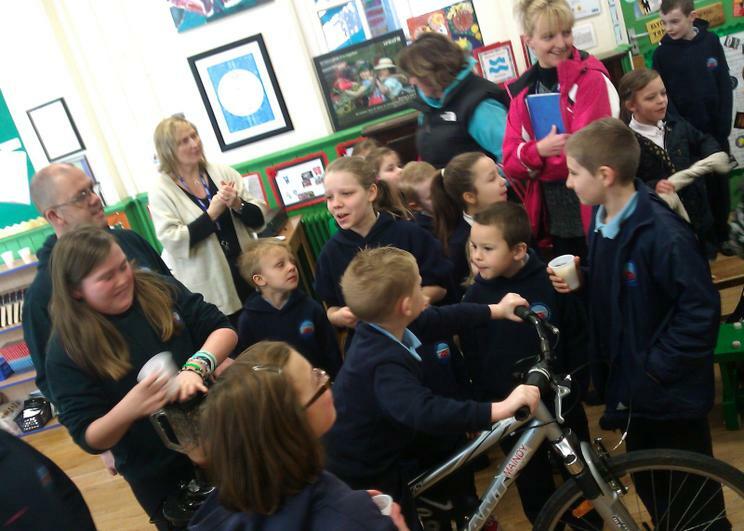 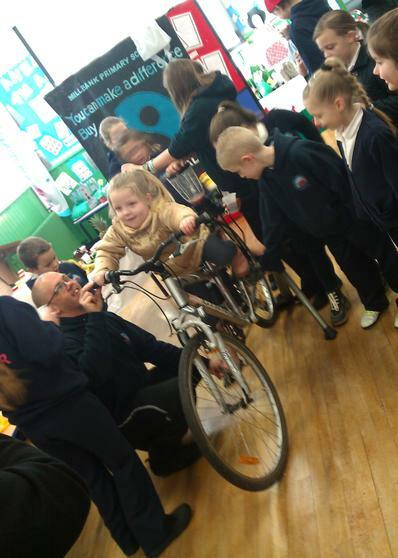 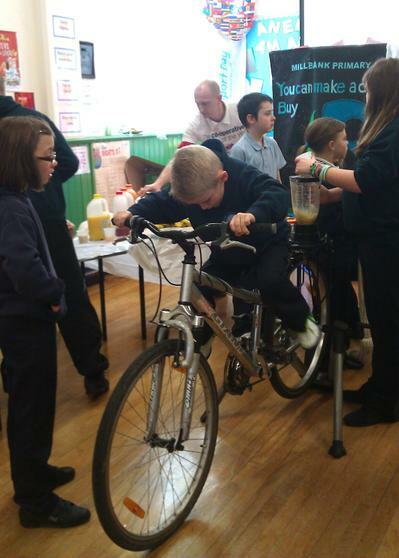 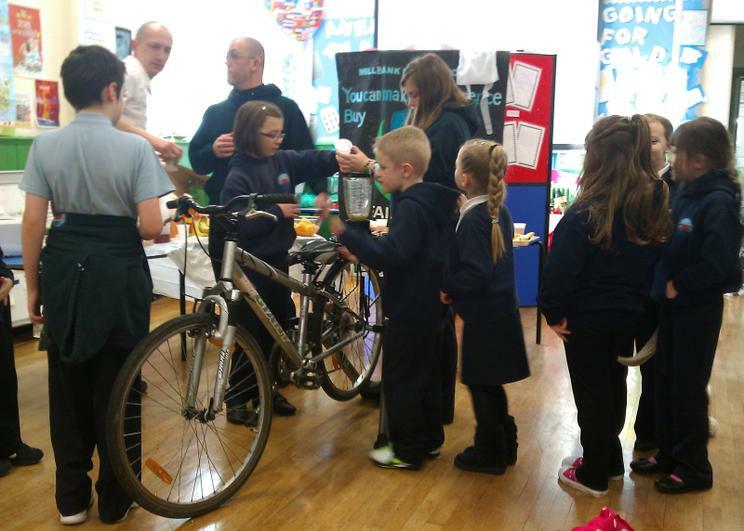 Children were encouraged to come in early with their bikes and make a Fairtrade Fruit face or pedal to power a smoothy maker! 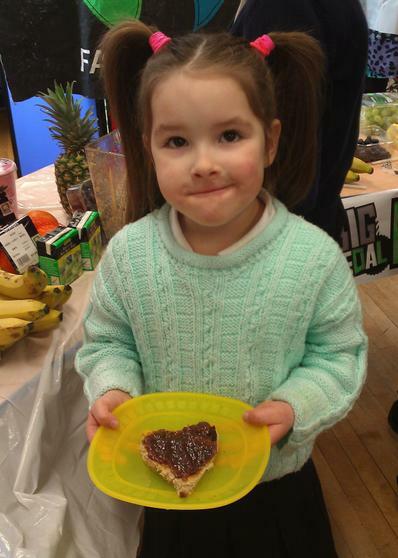 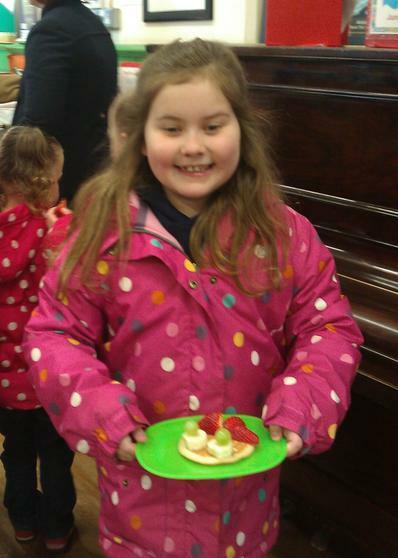 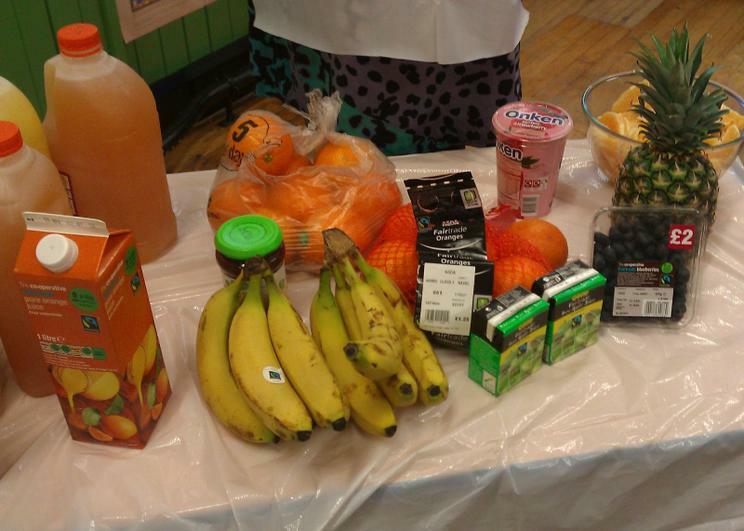 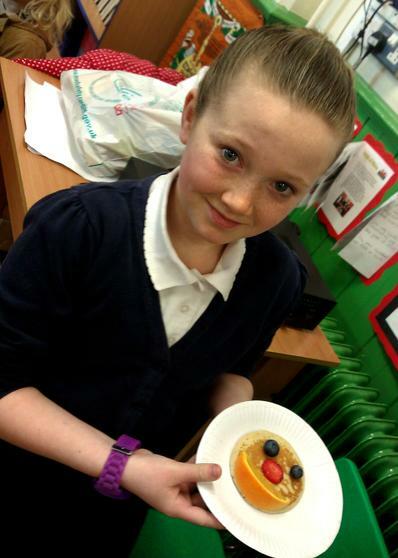 Our local Co-op store was very kind and provided the pancakes, wholemeal bread, Fairtrade fruit and Fairtrade juices. 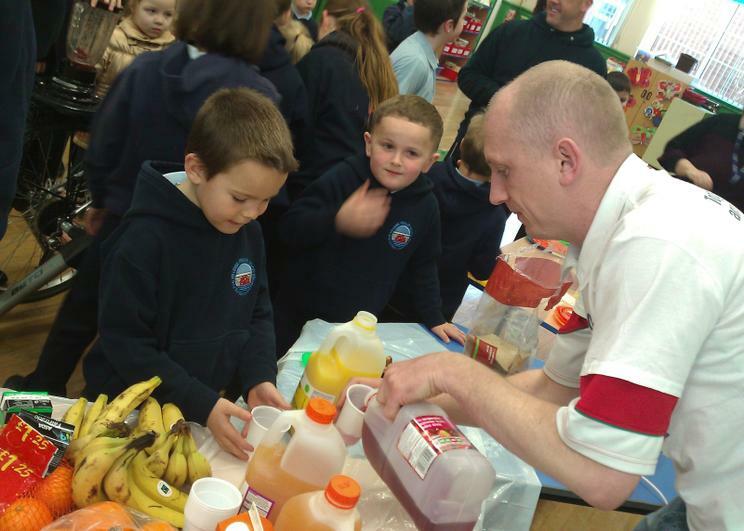 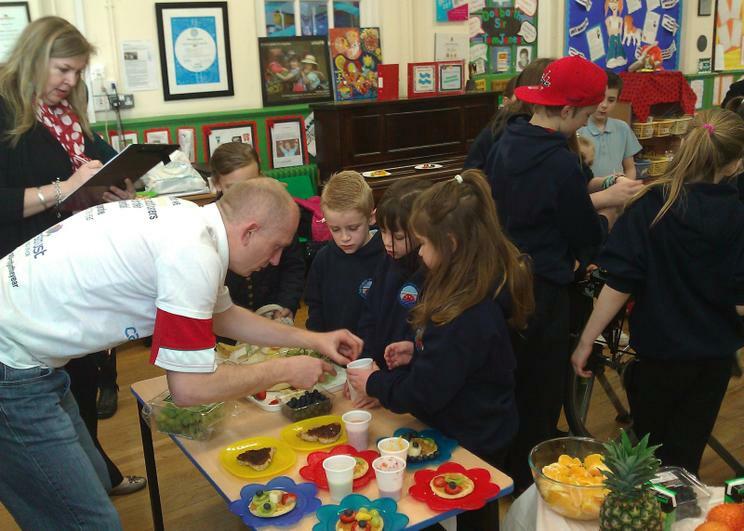 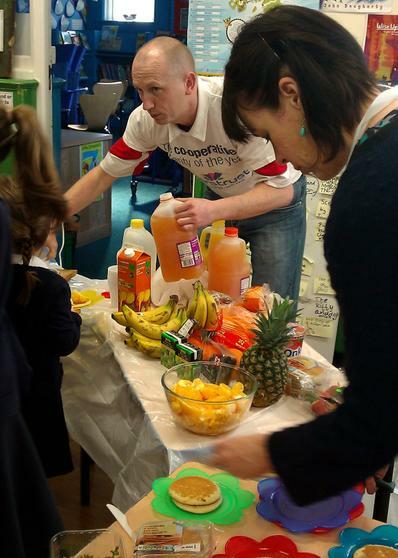 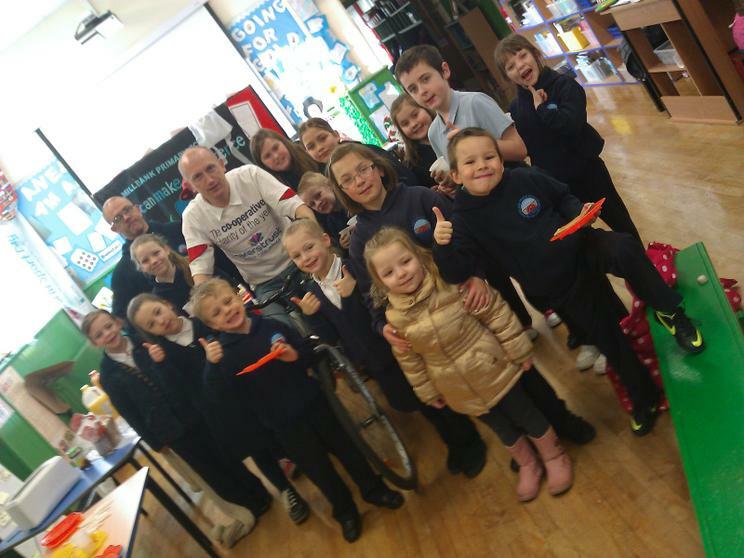 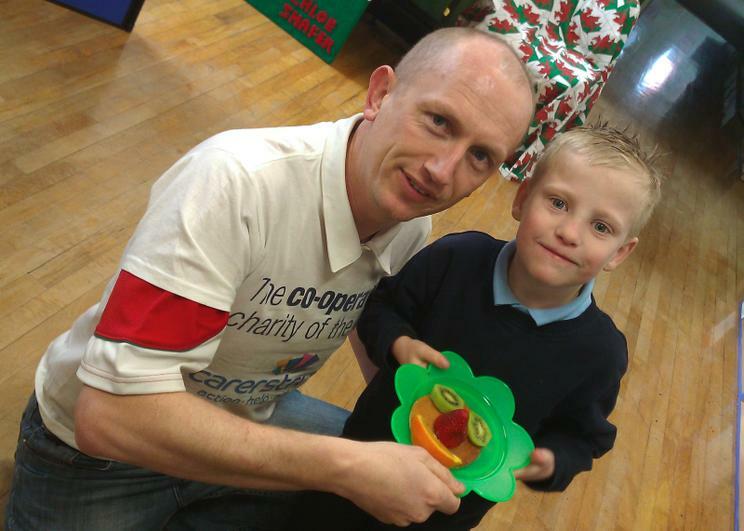 Store Manager Chris Whitton came along and really got stuck in serving the juices and fruit to the children. 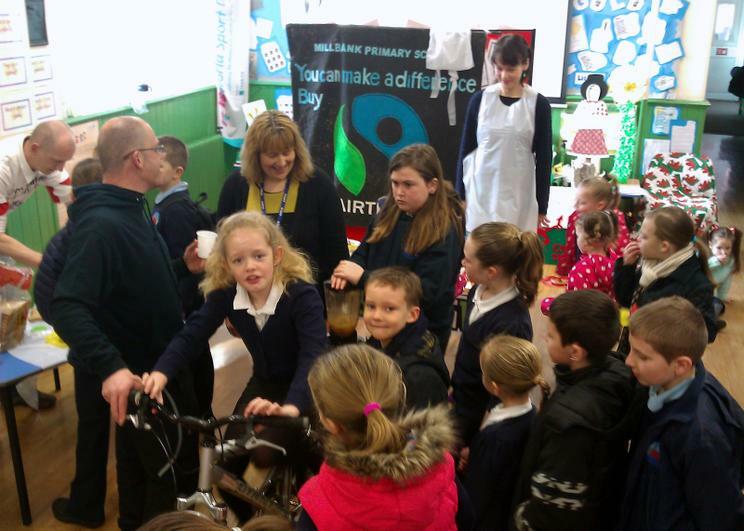 The Co operative store is of course one of the pioneers of Fairtrade and you can see how much we learnt about Fairtrade when we visited the store later this week. 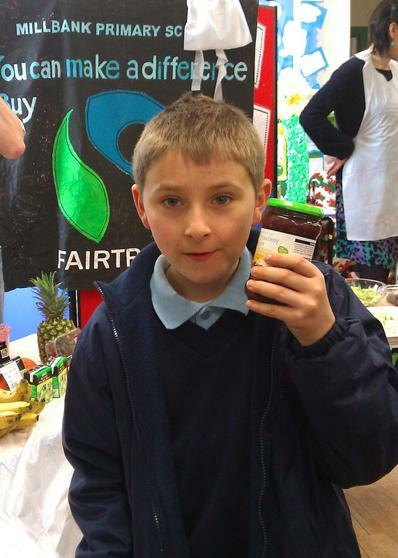 This years Fairtrade Fortnight theme is all about 'How far will you go for Fairtrade?' 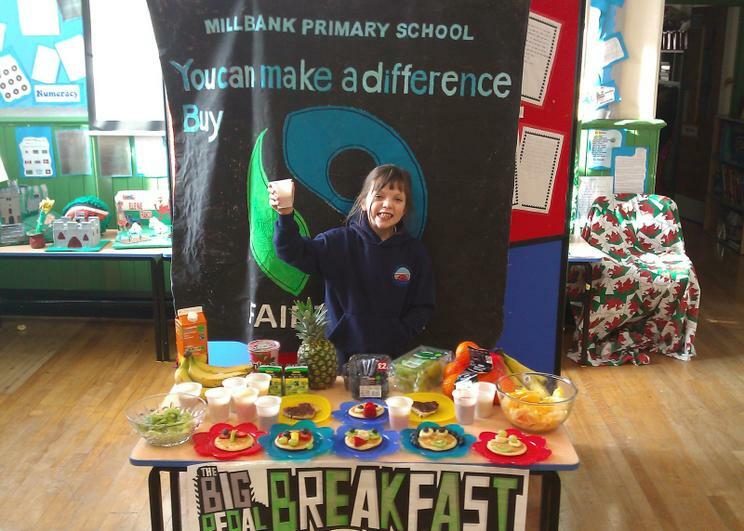 and asks ask to take a step beyond the Fairtrade Bananas, Fairtrade Chocolate and Fairtrade Coffee most of us. 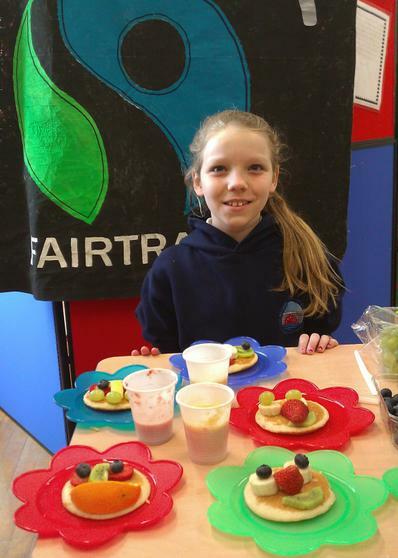 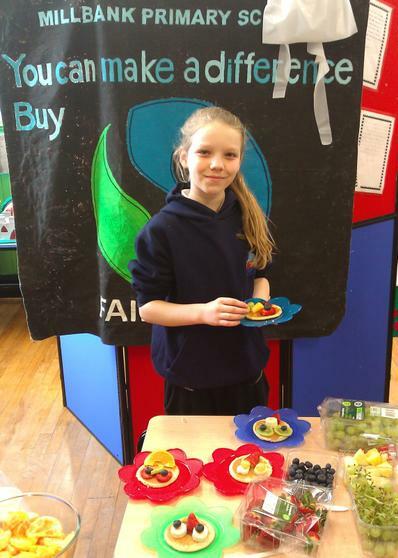 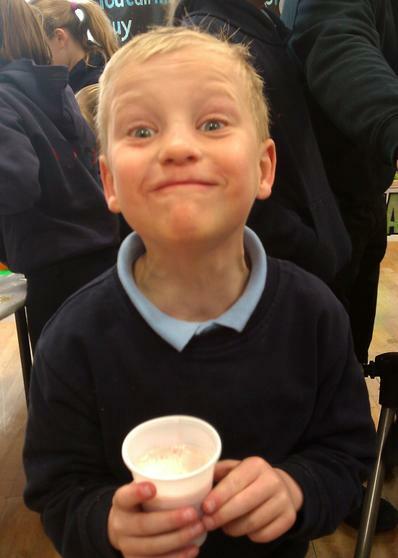 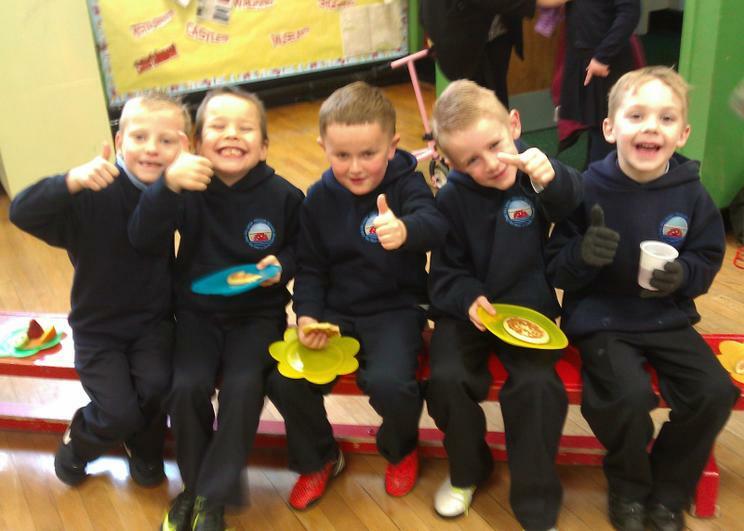 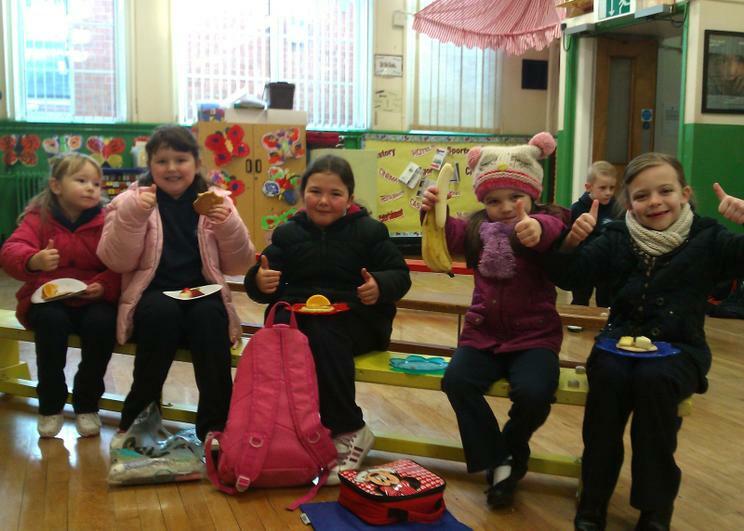 So it was great to see the children trying Fairtrade blueberries for the first time. 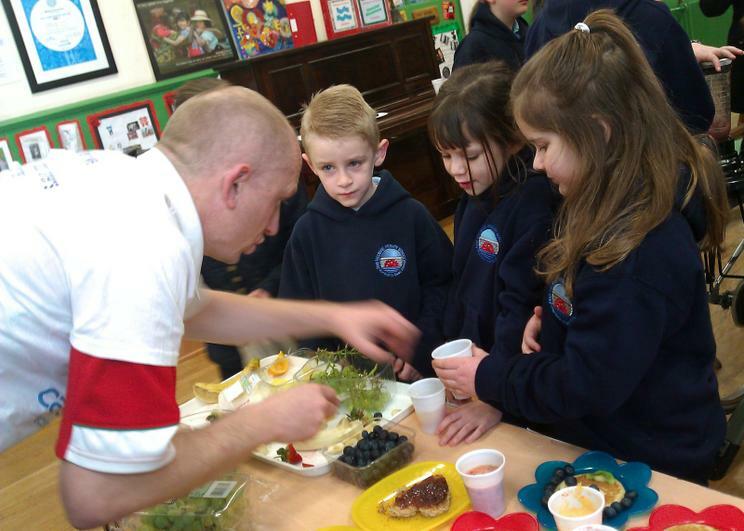 Of course the first thing we asked was for everyone to wash their hands before touched anything they were going to put in their mouth. 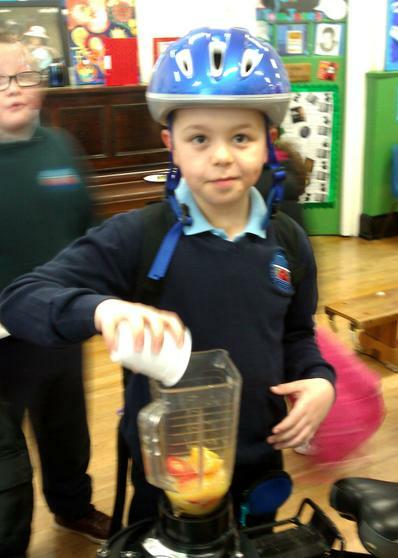 They choose the fruit and juice and tipped it into the blender at the back of the bike before peddling furiously to mix it all in. 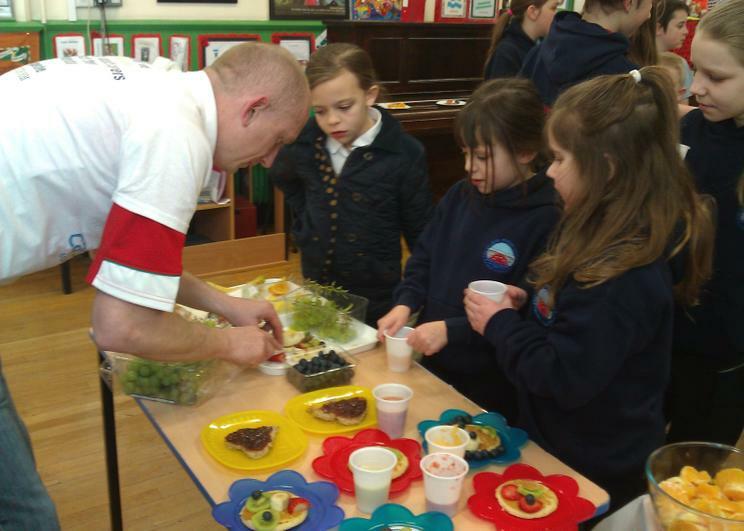 Some of it was lovely some of it was maybe a bit 'adventurous' for such delicate taste buds. 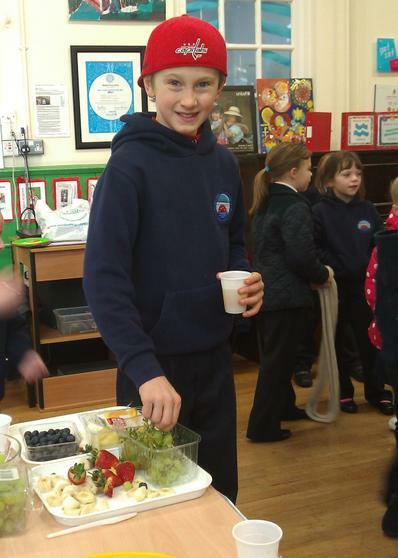 But everyone enjoyed making their fruit cocktail! 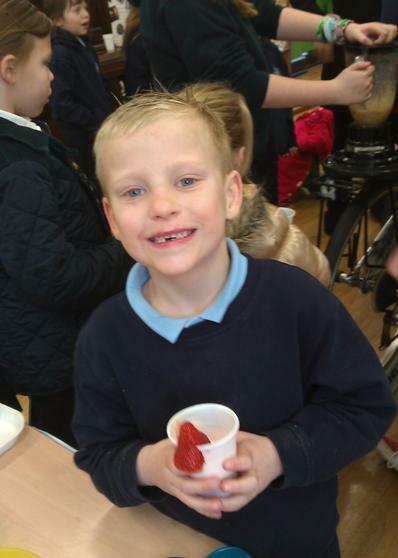 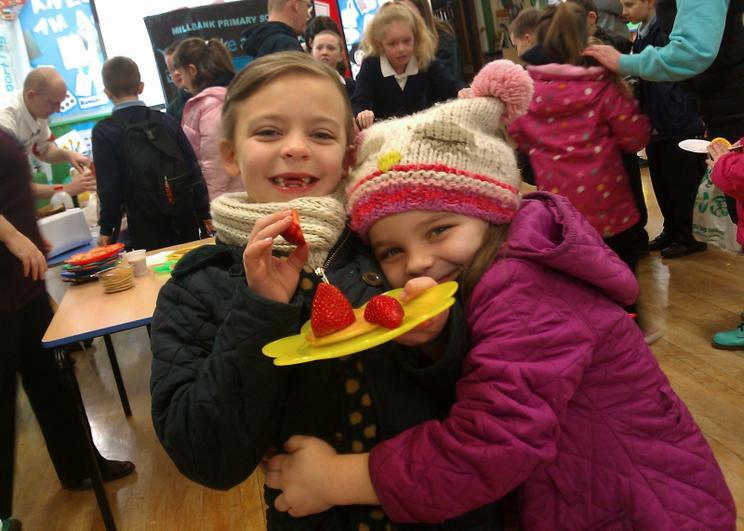 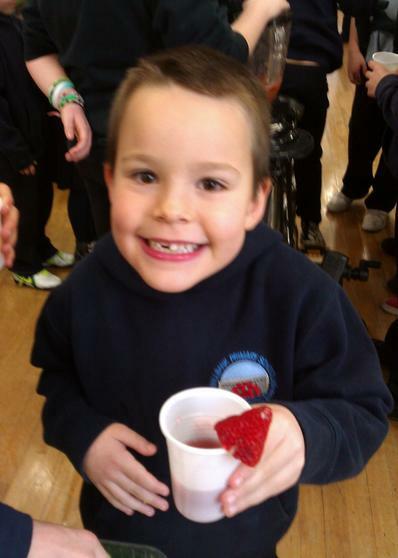 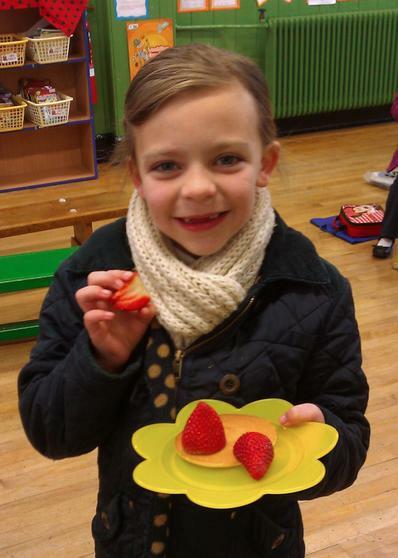 It was great to see somany children along with their mums and siblings having fun trying new fruits and berries. 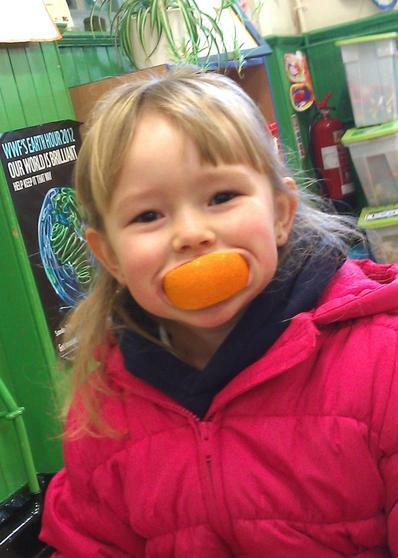 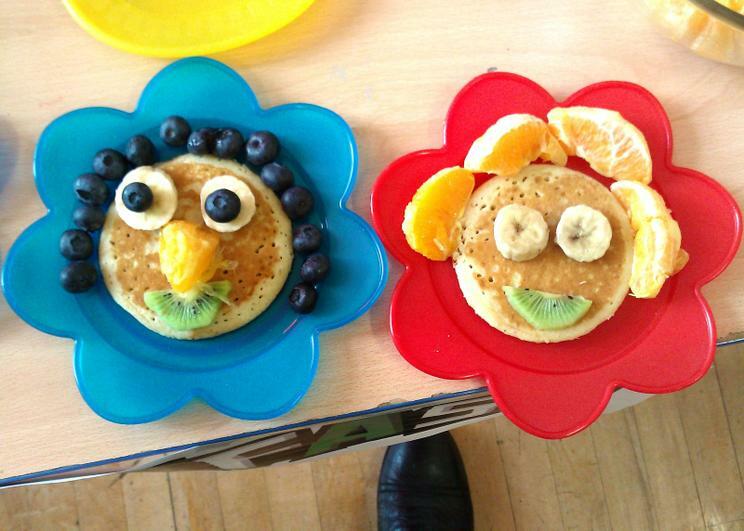 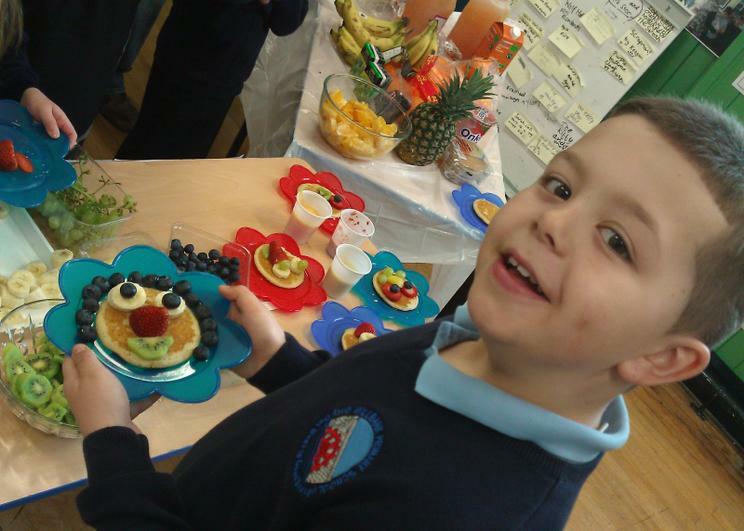 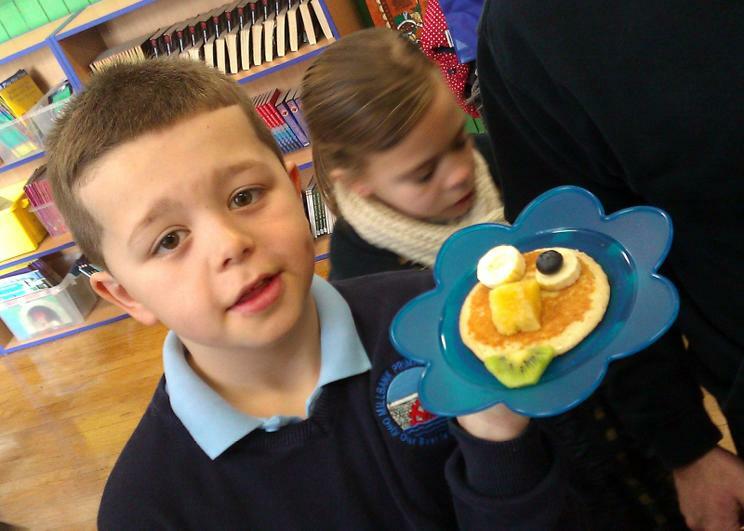 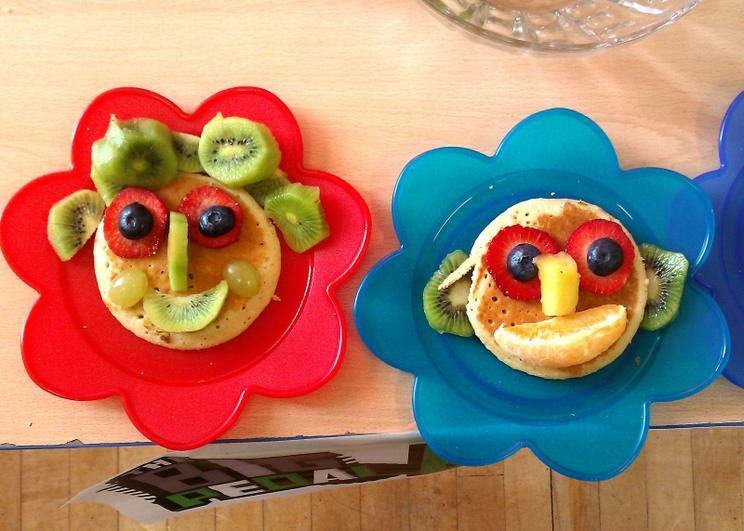 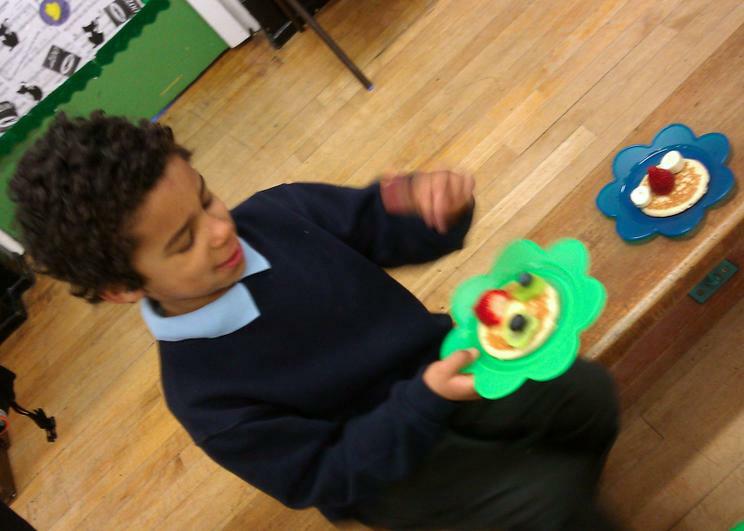 They were very creative with the fruit faces, best of all when it was done -they got to eat their artwork! 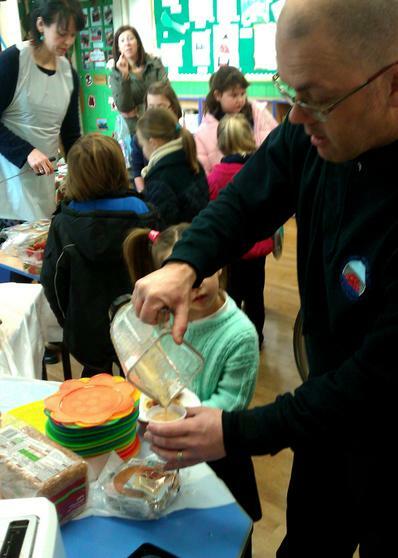 Of course we try and keep everyone informed about the sctivities and events and importantly why we are doing them via this gallery and the weekly parent's newsletter. 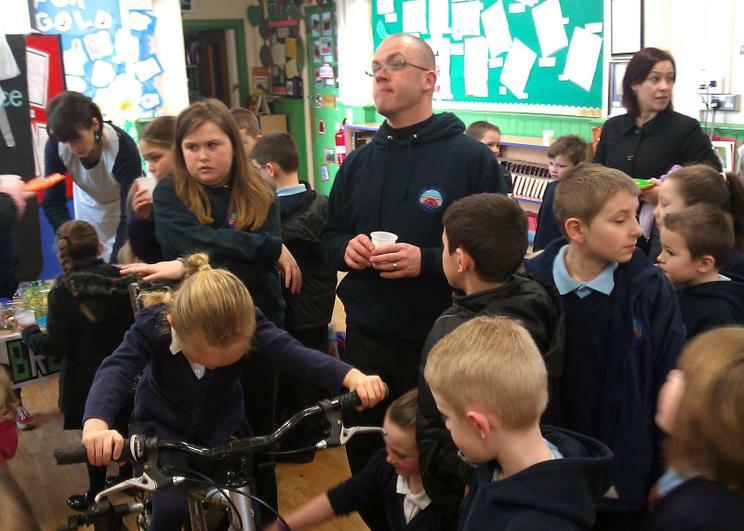 A big thank you to Mr Thomas our school Cycle champion for organising the event and working so hard to promote cycling at our school. 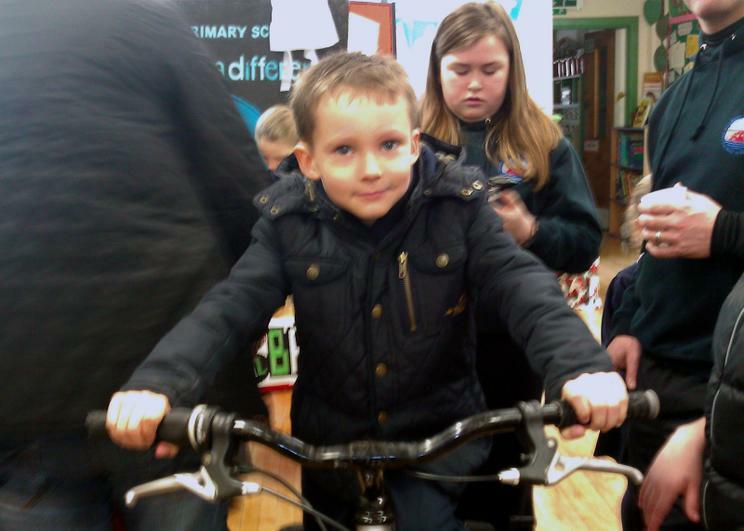 He has been pout every lunch hour with the juniors then the infants to help pupils cycle, gain skills and as ever have lots of fun. 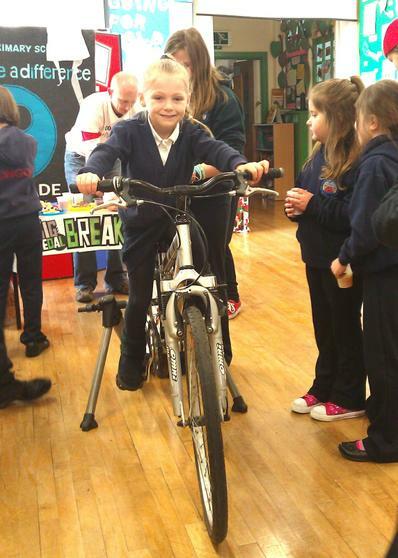 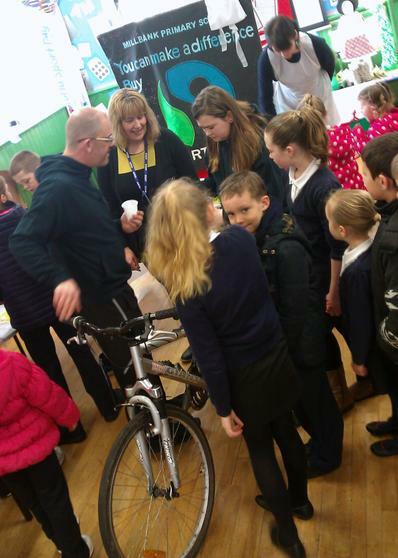 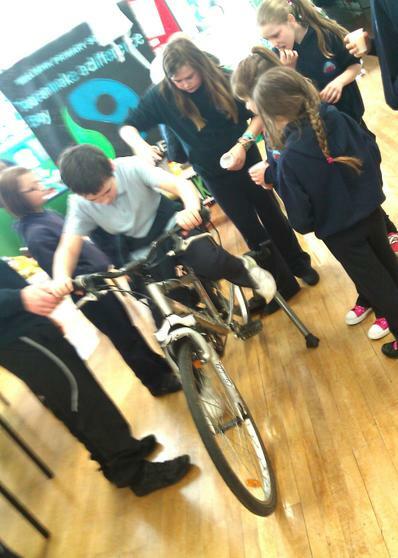 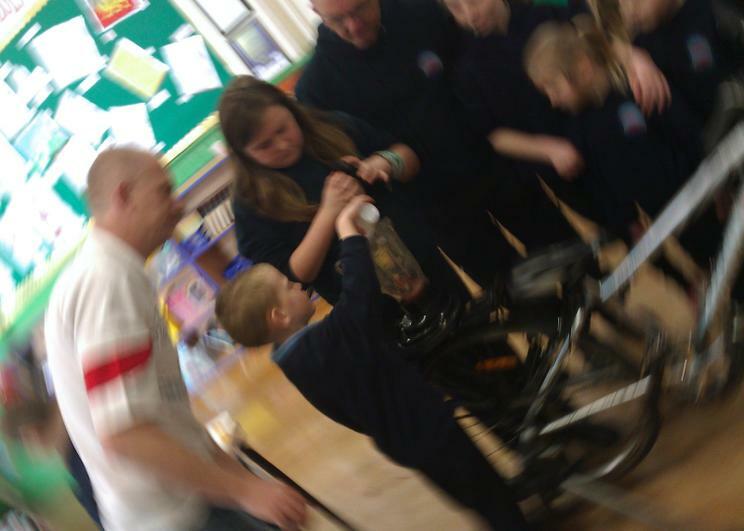 He has been giving out lots of prizes in assemblies to encourage everyone to keep cycling to school. 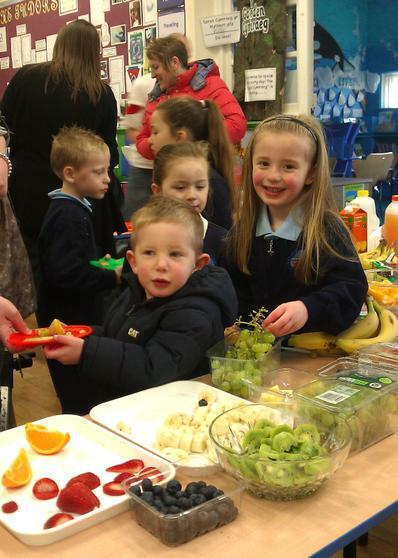 Thank you to Mrs Thompson who came in early to help prepare and serve the fruit to the children. 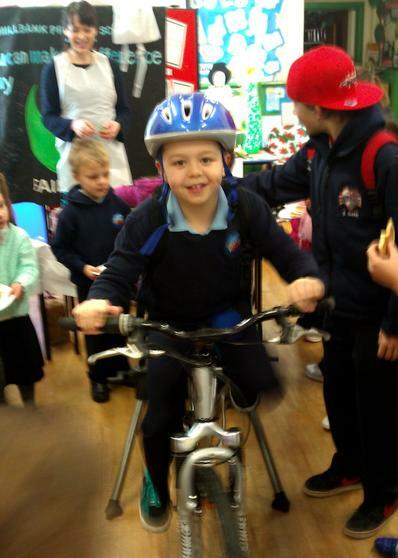 Of course a big thank you to all the families that have been supporting their children cycling to school through the Big Pedal. 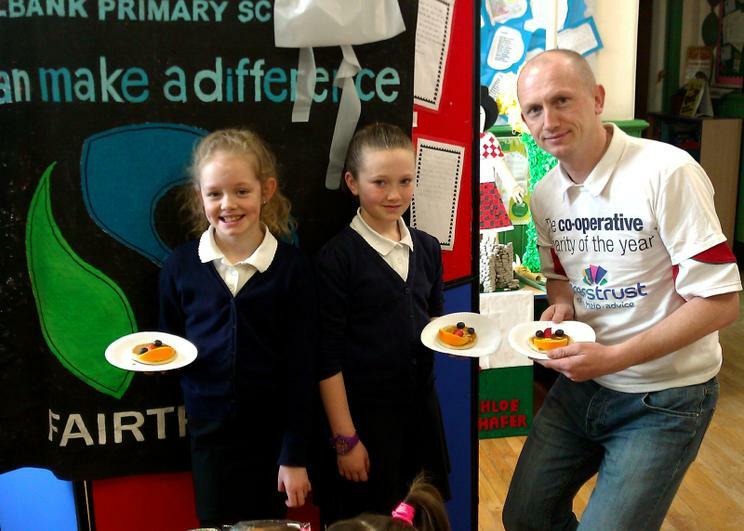 And finally another thank you to the Co-op not just for supporting their local community but for taking such an active role in promoting Fairtrade and so helping communities around the world. 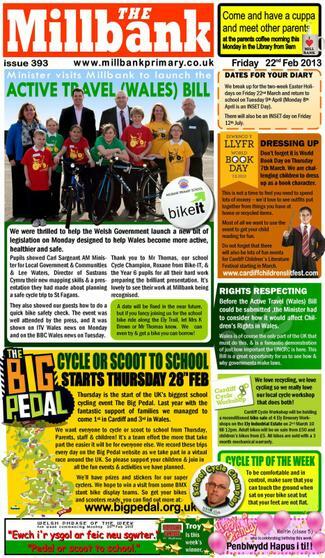 At the end of the Big Pedal, Millbank had managed to come 1st in Cardiff, 4th in Wales and 33rd in all the UK in the small schools under 150 pupils category. 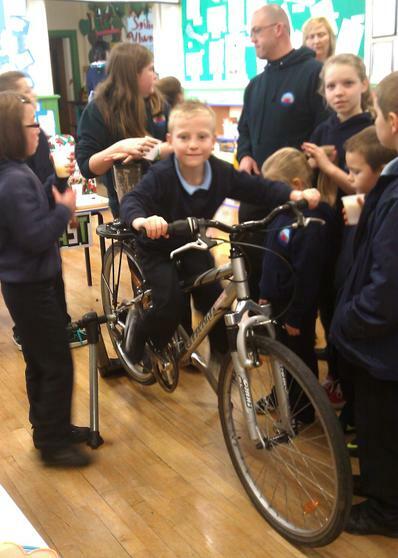 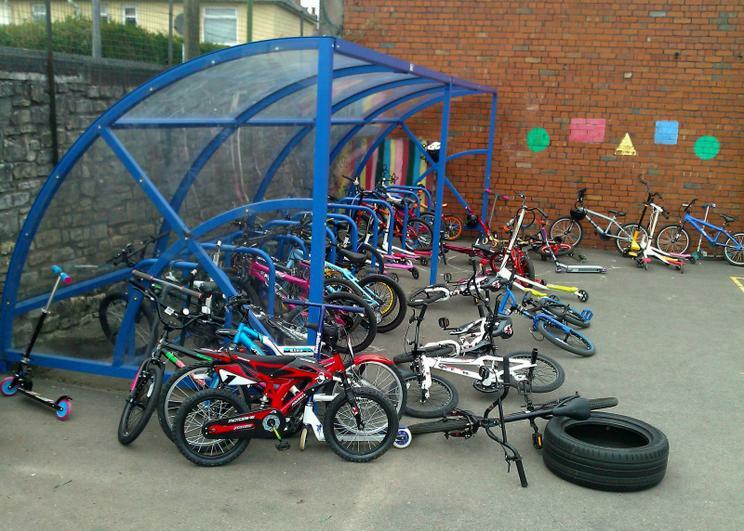 Not all the pupils can afford bikes but they have a go.